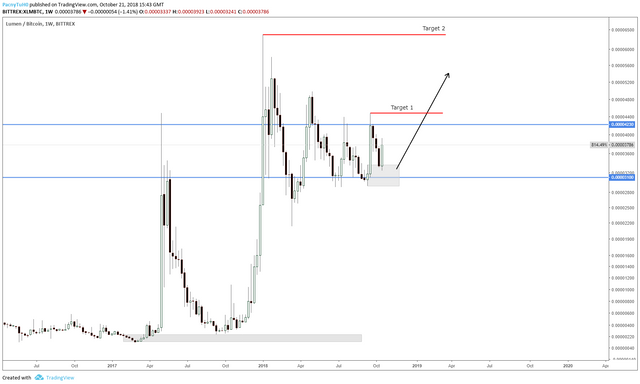 Stellar (XLM/BTC) is still in a weekly consolidation range but once again showing signs of strength. Price has bounced from the bottom of the range, around 0.000031, and is on its way to the top of the range - above 0.000040. Couple that with the fact that Ripple already rallied, and that usually Stellar follows it. The correlation between the two comes from the inventor of Stellar, who has been part of Ripple in the past. I see price targeting at least the local highs around 0.000045 and we can see it reach that level next week. Lately, there have also been rumors of Stellar being added to Coinbase in 2019, alongside coins like Basic Attention Token (BAT), Zcash (ZEC) and some others. These rumors could potentially help price move up if more people believe them to be true.